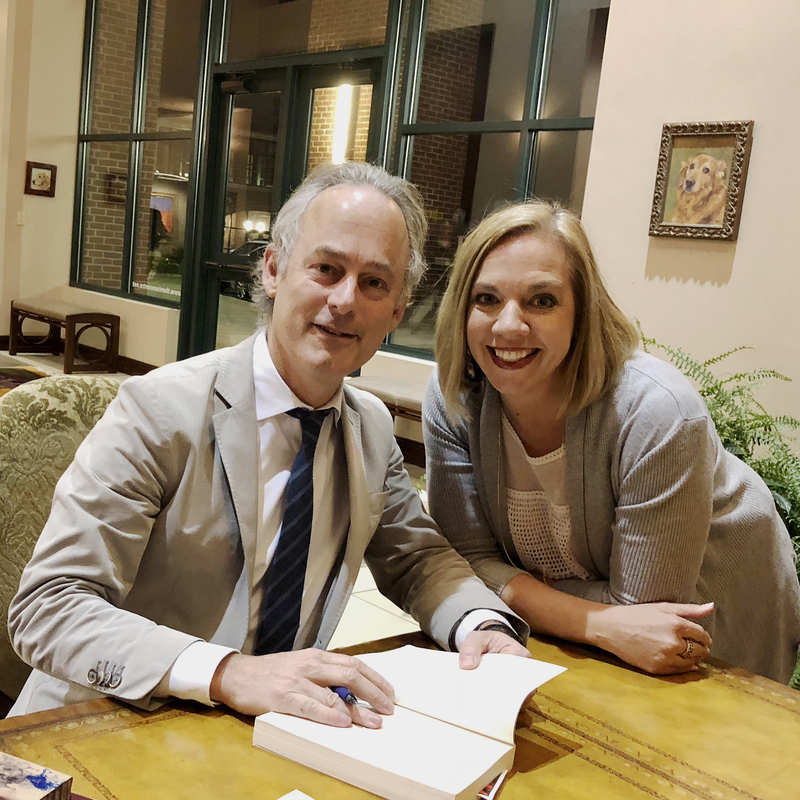 Amor Towles wrote Rules of Civility and A Gentleman in Moscow – two of my favorite books from last year. When I learned that he was speaking in my state, I was thrilled. I was even more excited when I figured out that while it was on the other side of the state in Newnan, Georgia, it did happen to coincide with when I would be traveling back home from being in Columbus, Georgia for work. It is obvious the fates were conspiring on my behalf. He was a delight. And while I didn’t think there was room to appreciate his craft anymore, I do. It would be impossible to fully capture the event, but I’ll share a few nuggets. While still working for an investment firm – a job he had for 20 years – he found himself living in hotels for a week at a time. On one particular trip to Geneva, realizing he’d been in the same hotel for the same week the previous seven years, he noticed that the people in the lobby were the same who were there the year before. The idea came of a novel about someone who lived in a hotel. He knew they’d have to be forced to be there. He combined this with his interest in Russian history and the revolution as well as some knowledge of the Metropol, and that became the preface for the book. Within 72 hours, he had 7 pages of a sketch for it. He had the idea for the structure of the book (how time spans forward in a doubling effect and then midway begins to shorten by half) many years before. When the idea for Gentleman came, he knew he’d use that structure for this one. He has a structured writing habit of, after walking his daughter to school, writing for three hours and then editing or planning the next day’s writing over lunch. In July, his family goes away, he visits them on weekends and writes voraciously while they are gone. He takes about a year to outline a book in great detail before he writes the draft. Gentleman was 70-80 pages of outline prior to its first draft. He likes to structure his writing. Both novels have a distinct structure that provide both a challenge and guardrails for his craft. He likened it to the sonnet and referenced the frequency with which poets of all centuries have used the structure of the sonnet to communicate their idea. He wanted to take exactly a year to write the first draft. He began on New Year’s Day and finished on New Year’s Eve – similar to how the novel is bookended – and with 26 chapters. A week for writing; a week for editing. 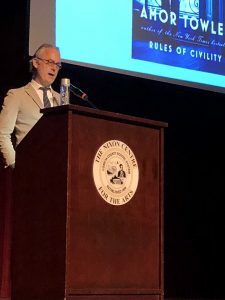 He’s currently working on a book about three 18-year-olds who are traveling from Kansas to New York City in 1952, and he begins drafting on April 1. That is all. He doesn’t talk about what he’s writing when he’s writing it. He wrote a chain of six stories called Eve in Hollywood that helped to tell what happened to the character of Eve in Rules of Civility when she left NYC for Los Angeles. It used to be available as an e-book. He thinks it would make a good novel, so it is no longer available. There was so much more that he shared, but it wouldn’t fit here. I hope that I’ve given you enough of a taste to go see him yourself if there is an event near you or to look up a podcast where he’s made a guest appearance. To get you started, listen to Literary Atlanta Season 1 Episode 29. (A most gracious thank you to @AlisonLaw and her tweet that let me know about this event!) 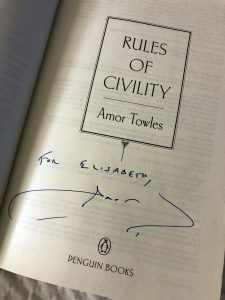 And of course, be sure to follow Towles on Twitter @amortowles. My sister enjoyed A gentleman in Moscow and so I did! I was mostly pleased by the sentence structure, Amor can write! His beautiful work of art was my night time companion each evening initial I finished it, what a captivating read, thank you! I want to meet the Count!